They wore many colors, but one was wearing a blue. By the time we returned from Badda Police station, one of our friends who was severely assaulted by the police, recognized a man standing very close to the police station; “He was the one who showed us and then police did the rest” our friend shouted out of excitement. Surprised? The attackers were young, they were Sramik league goons, they showed our friends, targeted one by one, and police did the rest; they took our activist friends in narrow alleys to implement their mission. Even in the open street, under the gaze of hundreds of cameras and journalists, some of the attackers and police freely participated in the assault. Just a day into Delwar Hossain’s coming out of the jail and we see a number of our activist friends assaulted and injured. Is it a coincidence? Just a coincidence? Many of our friends are injured. Some very seriously; Samina and Haider, both dramatists came to show their solidarity with the fast unto death strikers at Tuba; they were assaulted without any mercy; Samina a faculty of DU Sociology repeatedly said: “I am a teacher. We came here to show our solidarity …. ” But no one gave a heed. The attackers used sticks and hands. There were some female police too! Saydia, activist and researcher who has been relentlessly working for the rights of the workers since the Tazreen fire was not spared too. Assaulted mercilessly she is finally in DCH, her hands in a sling and under antibiotic and painkiller. 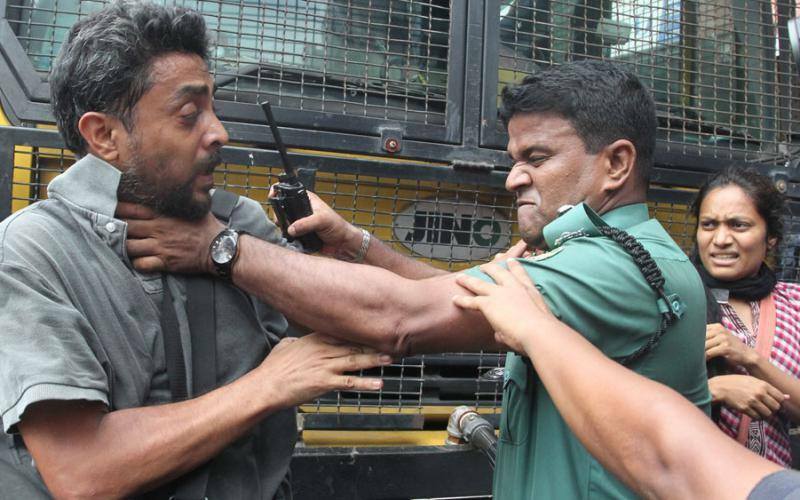 Quamrul, another friend of us protested the manhandling of a female activist (Shabnam) and for this and only for this, both of them were detained at the Badda police station from 2:00 pm to 11: 00 pm. Our friends were all taking part in sit-ins, there was no militancy involved. The workers were locked and police did not allow anyone to go up stairs. Some of our activist friends wanted to reach out the striking Tuba workers with saline and some other essentials. Police did not allow. Instead, they decided to crack down on them. 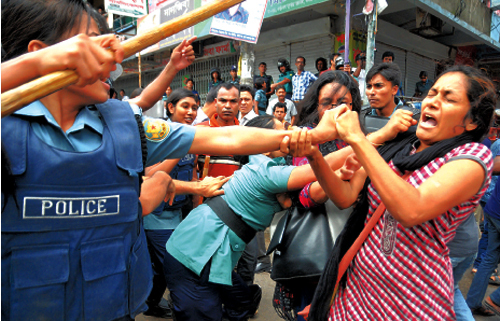 So this is presently the scene in Bangladesh. There is no mercy if you show solidarity with the workers who have organized a hunger strike for the last 10 days for their three month’s salary and Eid bonus. If you show solidarity with trade bodies such as BGMEA, you are safe! They seem more powerful than the state. The state machineries are hell bound to protect them and their market interests and not the workers. However, we do not expect worker’s welfare from a state like this, run by the principles of neo liberalism. There is no leadership. Statesmanship sounds a word not in use anymore, outdated and old, a word from the past perhaps! Market, yes!! The Managers of this state are poorly managing the scheme of things for many years now. There are better examples even of neoliberal states. But simply asking for better management seems a far cry in a country where launch capsizes and people die and there is no change of the managers, not even a pressure from above! People’s unity is the need of the hour.